Sterling’s legs have gotten a LOT of attention over the past week! As I posted previously he was crazy lame last Tuesday evening with what we suspected to be cellulitis. The vet came to see him on Wednesday afternoon and confirmed the cellulitis AND that it was caused by a 3″ deep puncture wound. So that “scrape” was actually 3″ deep and had hit the bone. The vet was concerned that there was damage to the bone, but wanted to wait a few days to see if there were symptoms to indicate bone damage. 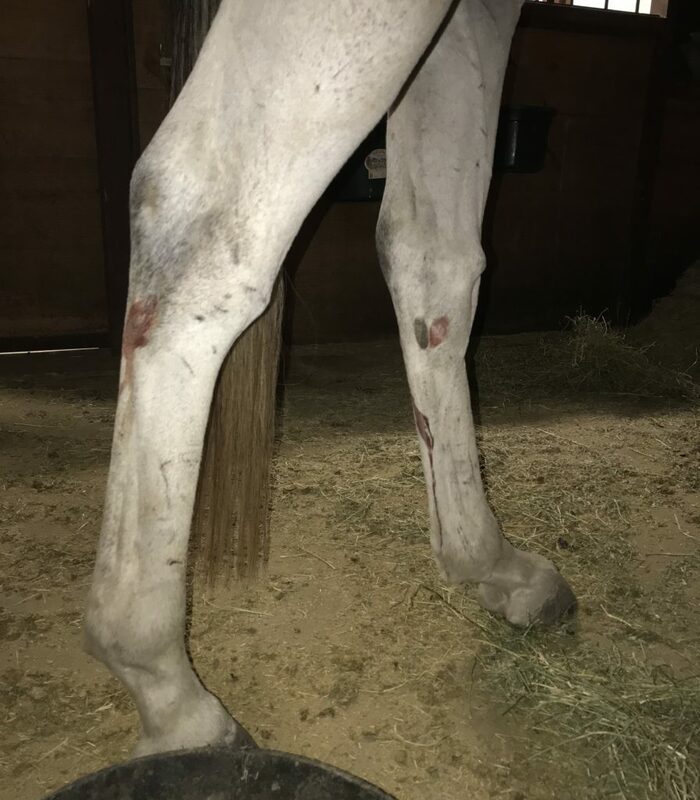 Sterling got put on a regimen of antibiotics twice a day, steroids with a pain killer for four days, then every other day for eight days, cold hosing twice daily, a furazone/DMSO sweat application and leg wrapping if/when the swelling moved from his forearm down to the cannon bone and finally medication IN the puncture wound. His lameness improved within 24 hours of treatment and by Sunday evening the swelling was nearly entirely gone. Hallelujah! He HATES the oral antibiotic, but isn’t a complete jerk about letting me give it to him. He also really hates the powder medication on his feed, but after pawing at it, flipping his feed pan over and pouting in the corner for about an hour, he usually finishes it, too. I combine applesauce with his feed when he gets to powder and, in my head, it helps the meds taste better. By Day 4 he wasn’t going to let me stick anything else in the puncture wound, which was fine because the wound scabbed over entirely by Day 5. 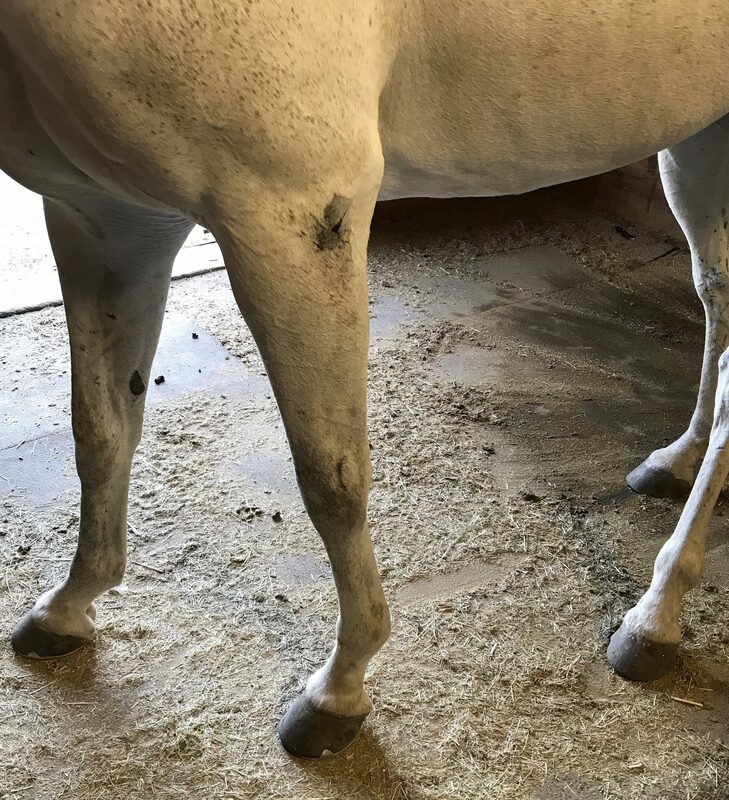 My regular vet had been out of town for the cellulitis/puncture fiasco, but had been scheduled to come over this week to look at some soreness Sterling had in his back at the last horse show. 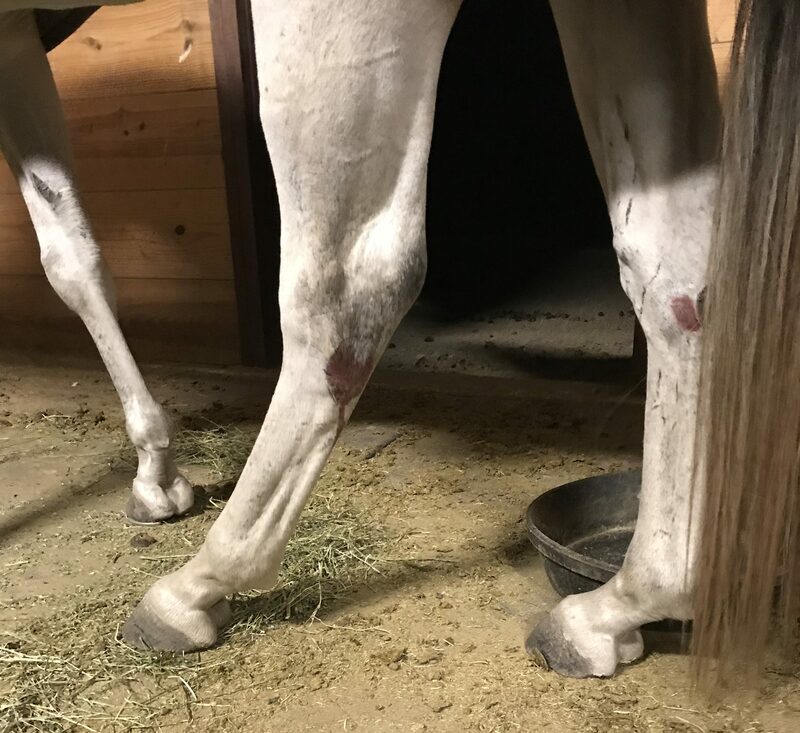 After a full lameness evaluation my vet concluded that Sterling has soreness in his hocks that he is compensating for and is causing the back pain. 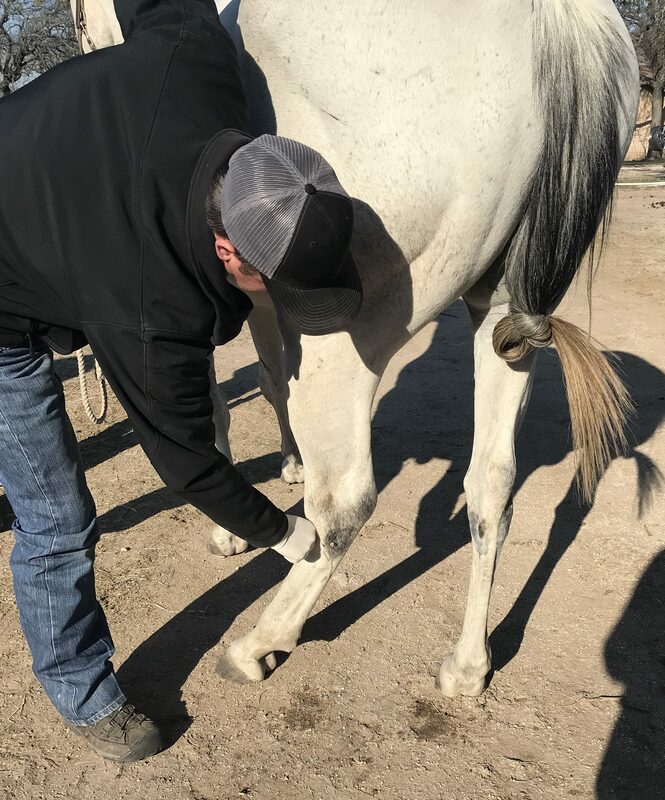 This isn’t terribly uncommon for a horse of Sterling’s age (11) so I wasn’t surprised that we will now be doing hock injections a couple times a year. For these injections the horse is sedated to prevent any unnecessary wiggling while being stabbed in the hock. Each hock gets two injections, one on the inside and one on the outside. 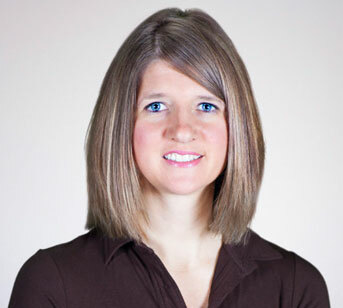 It is an intra-articular injection which means it goes directly into the joint to reduce inflammation and pain. Most likely the injections will need to continue for the rest of his life at an interval of about every 6 months, but that may depend on his work load. Most people in the sport horse world will tell you that joint injections are a matter of “when” not “if” they need to happen. You can see here where the injection was done. The hair is wet and there is some blood. After the injections my vet recommended that Sterling stay in his stall for the day and he can resume work again after about three days. Considering the puncture wound/cellulitis issue combined with the hock injections I’m probably going to wait to ride him until next week. 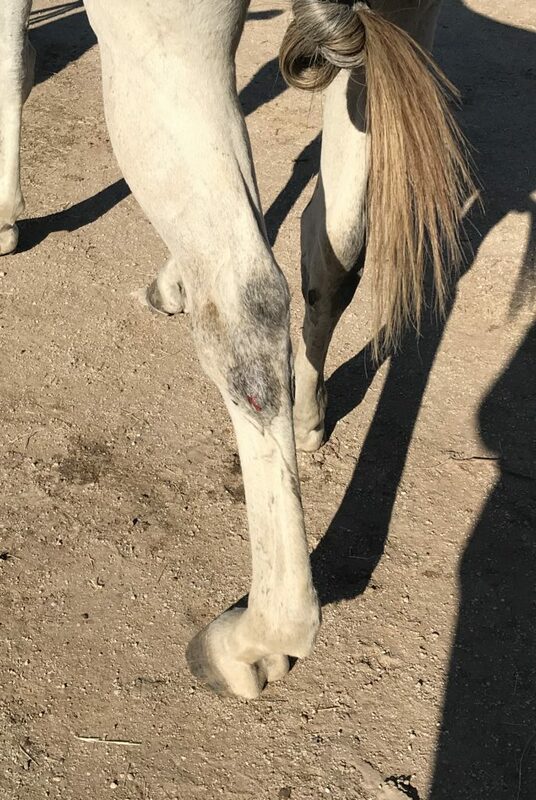 Another one of the joys of having a grey/white horse is that after something like injections you can see the blood, even though there was hardly any. His poor hind legs look like he participated in some weird ritual leaving him with four small blood spots on the same part of each hind leg. He’s so done with me fussing with his legs that I didn’t want to fight with him to wash them off. I’ll have an update on Coco’s vet visit later, too. She didn’t want to be left out of all the fun. Glad to see his leg is looking better and better! Thank you! I am, too! oh man, that’s so scary about the puncture! glad it wasn’t worse!! We aren’t completely out of the woods yet, but I’m optimistic it is healing well.